Archaeologists on the HS2 project have begun work on Europe’s largest archaeological dig, exploring over 10,000 years of British history along the 150 mile route from London to the West Midlands. As part of HS2’s enabling works, over the next two years, more than 1,000 archaeologists, specialists, scientists and conservators from across the UK will be exploring and recording over 60 archaeological sites for the project. 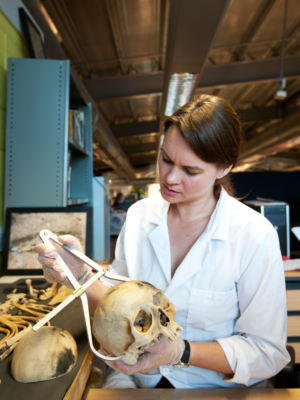 Above: An osteologist from MOLA Headland studies a skeleton excavated for HS2. Ranging from the Prehistoric and Roman Britain to the Anglo-Saxon and Medieval periods, and the Industrial Revolution and World War Two, HS2’s archaeology programme is Europe’s biggest dig and promises to provide a fascinating insight into the everyday lives of the people and communities who made modern Britain. The archaeology programme is a central part of HS2’s ground preparation works for Phase One of the project – London to Birmingham. HS2, its contractors and supply chain are well underway with a programme of work, clearing sites, ahead of main construction works next year. Given the historical significance of the sites, HS2 will be engaging over 1,000 archaeologists to ensure that the works are carried out to a professional standard while leaving a lasting legacy of skills and apprenticeships as well as new discoveries. Early finds include prehistoric tools in Buckinghamshire, medieval pottery in Stoke Mandeville and two Victorian time capsules with more discoveries to come as archaeologists begin the exploration of our past. Commenting on HS2’s archaeology programme, Mark Thurston, HS2 Chief Executive said: “How we build HS2 is as important to us as what we are building and we are committed to sharing as much of our cultural heritage as possible. Before we bore the tunnels, lay the tracks and build the stations, an unprecedented amount of archaeological research is now taking place between London and Birmingham. This is the largest archaeological exploration ever in Britain, employing a record number of skilled archaeologists and heritage specialists from across the UK and beyond. re-telling the story of a Buckinghamshire village through the careful excavation of a 1,000 year old demolished medieval church and burial ground. comparing and contrasting the lives of the buried population in two Georgian/Victorian burial grounds in London and Birmingham.